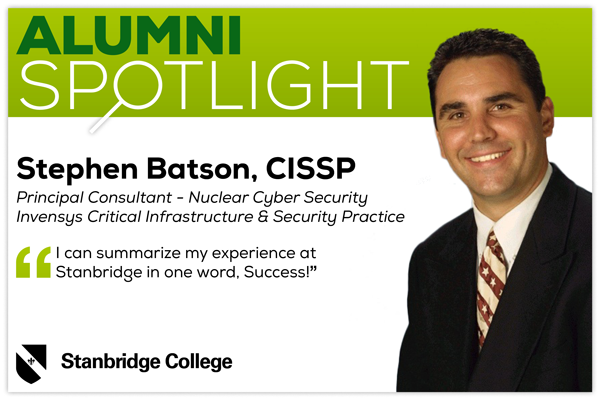 Stanbridge College spotlights Information Technology Alumnus, Stephen Batson, CISSP. Stephen is currently the Principal Nuclear Cyber Security Consultant at Invensys Critical Infrastructure & Security Practice. Stanbridge recently sat down with Stephen to talk about his experience at Stanbridge College and how his success at Stanbridge was crucial for advancing his career. SC: What were you doing before you attended Stanbridge College? SB: Prior to attending Stanbridge College I was a computer engineer at San Onofre Nuclear Generating Station. SC: What was your inspiration for going into the IT field? SB: Computers play a critical role in controlling many nuclear plant control systems. Combining in-depth knowledge of computing systems with my background in instrumentation and control systems allowed me to stay on the cutting edge of my profession. SC: Why did you choose Stanbridge College for your IT program? SB: Stanbridge College provides a comfortable and professional training environment with top notch instructors. The staff helps their students to identify and achieve both short and long term goals. The curriculum positions students to achieve certifications recognized by the industry. And finally, the tuition is extremely competitive. SC: What was your first impression of Stanbridge when you started your IT program? SB: Stanbridge has the professional staff and instructors that will help me obtain the certifications needed to advance my career. SC: What was your overall experience like at Stanbridge? SB: I can summarize my experience at Stanbridge in one word, Success! Stanbridge took me under their wings, worked with me at my pace, and gave me everything I needed to obtain my certifications. SC: Have you taken any of the IT certifications? SB: MCP, MCSE 2003, MCSE 2003 +Security, CISSP. SC: Did your IT training help with your performance? SB: Stanbridge training greatly enhanced my performance at work, opened the door to a new position as Cyber Security Program Manager at Westinghouse, and now Principal Nuclear Cyber Security Consultant at Invensys. SC: How did you utilize the Career Services department at Stanbridge? SB: Stanbridge helped me to establish short term and long term goals on a realistic timeline. SC: What did they help you with that made an impact on your job search process? SB: Stanbridge helped me to select the training I needed to advance my career and obtain my dream job. SC: Have you or do you currently do any community service? SB: I support the IT and security needs of Hands Up High Ministries. I am on the board of advisors for Stanbridge College. I have also been involved in several working groups focused on developing cyber security standards for the nuclear industry: IEC, IAEA, DHS, EPRI, ISA, NEI, NITSL, NRC, and INL. I am also involved in the FBI Infragard, and on the board of advisors for CSCSS. SC: Has that affected your career in any way? SB: Staying involved in industry efforts has allowed me to contribute to the security of our critical infrastructure while developing essential professional contacts. SC: What do you hope to achieve in your career in IT? SB: I hope to stay involved in cutting edge approaches to cyber security while contributing to the security of our national infrastructure. SC: Do you want to continue your education in IT? SB: Continued education is a fundamental necessity for continued success in any IT field. SC: What advice do you want to give future IT students? SB: Learning never stops in the IT industry, so focus your learning effort. Work with Stanbridge to establish short and long term goals on achieving the education and certifications you need to achieve your dream career positions. Then work hard to achieve your goals, and enjoy your success! SB: I focused on obtaining IT / security certifications that could support my career, and I volunteered for various working groups that address cyber security for the nuclear industry. For more information on the Information Technology programs at Stanbridge College, please visit www.stanbridge.edu.